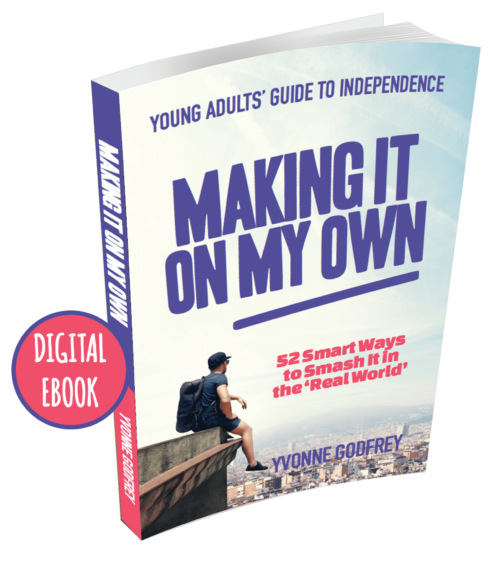 Simple and easy ideas to inspire your yadult to be self motivates – instead of nagging them! Practical solutions to solving conflict and building a healthy relationship. How to know the right time for your yadult to leave the nest. Fantastic, easy read. This book not only has some great gems of guidance and better ways to equip ourselves, I have learnt so much about myself and the type of parent I am now, which is a great start, to being the type of parent I want to be for my own Yadult. It shows it is never too late to learn new skills. Nicola Pearson – Mum of a 21-year-old daughter. 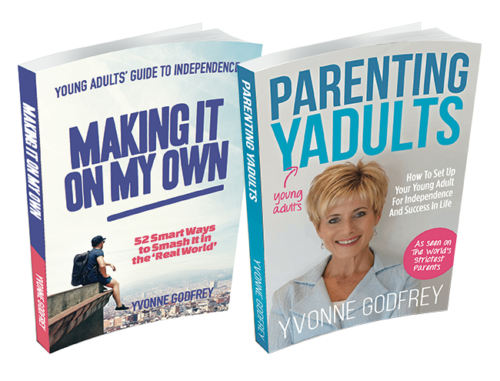 Yvonne – reading your book has been enlightening and has shed light on how to deal with our 2 sons aged 20 & 18. You have given me such valuable perspective in so many areas. So many things made sense to me. 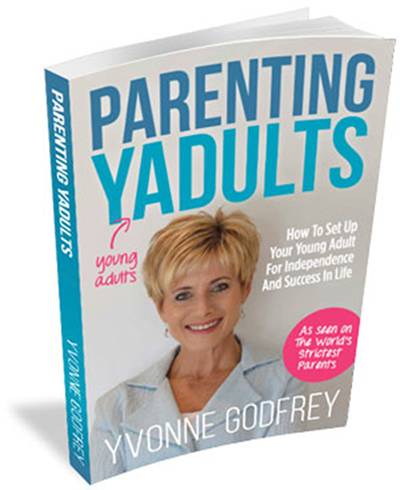 Thankyou for writing this book….. Every parent needs to read Parenting Yadults – it’s an awesome roadmap on the journey of raising young adults. I’m a 30 year old entrepreneur focused on building my startup. 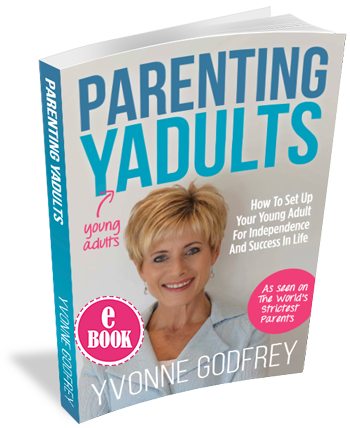 When my Mum lent me ‘Parenting Yadults’, I wasn’t sure what to expect but it pleasantly surprised me! One of the biggest insights Yvonne describes is so true: Parents need to let us kids fail (more often). Not to neglect us or set us up to fail but to actually let us fall and learn find our feet again. As I’m not a parent I’m sure it’s easier to say than to do, but as a child, I know I’ll become a stronger person that way. 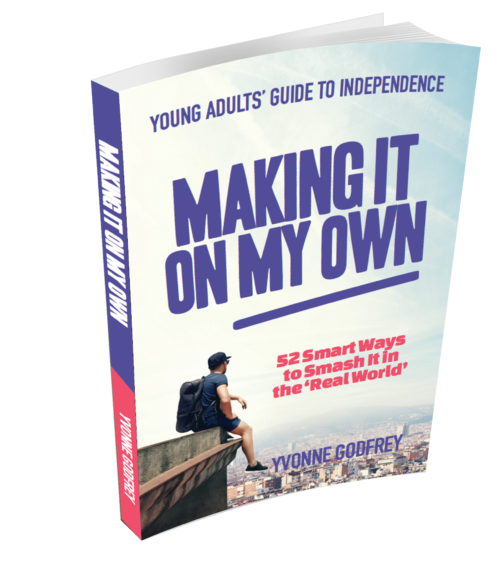 Yvonne has a beautifully simple way of providing insight and imparting universal wisdom that’s memorable, sticky and applicable. Parents take the initiative. Read this book and give it to your yadults to read to. I know I appreciated it. I would strongly recommend all professional business people read this book. Far too many professionals (in many cases both husband and wife ) are devoting most of their time chasing the almighty dollar to the detriment of spending quality time with their children. Throwing money and material things at your children is not a substitute for nurturing them through all the challenges that life will throw at them..
Yvonne never ceases to amaze me! This wonderful book contains so much common sense (which is not so common) and wisdom. All the way through there is reinforcing and supporting of good parenting relationship decisions. Valuable and important topics such as understanding personalities which is so vital to understanding each other and the art of building healthy relationships are only a couple of life changing topics covered. Discover for yourself by reading this book and then pay it forward!!! Thank you so much. Yvonne for speaking into families lives and sharing your love that you see in the worthiness of building strong family. Your book is great with very practical, common sense advice. A good one to pick up every now and then for reminder tips also!